Literacy, families and learning: Making Books Come Alive! It's the summer school holidays in Australia, and it is hot. So forgive me if this post seems more suitable for summer than a northern hemisphere big freeze. But your turn will come so you can explore these ideas when the weather clears (or I'm sure we could think of some good winter examples). It helps young readers gain a stronger sense of the setting and its importance for literature (see my post on 'Visiting the 'real' place in 'My Place' HERE). It helps young writers to see how a place can be represented in words - how do we turn the sights, sounds, smells, tactile experiences and even tastes, into written language. It enriches the experience of reading a book and deepens understanding of the book and its content. It enriches other disciplines like geography, history and science (HERE). If you are a parent on holidays, or a teacher wanting to plan an excursion with a difference, why not make a book come alive with an outing that enriches their knowledge and deepens their reading while teaching them about writing. I have already written a number of posts that talk about some of these opportunities. I'll mention some of these as well as pointing to some other options that I haven't mentioned before. 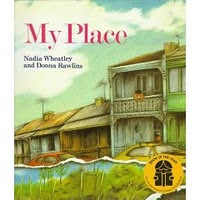 I wrote a post back in January 2009 (here) about a family excursion to explore part of Sydney that was the setting for the wonderful book 'My Place' (Nadia Wheatley & Donna Rawlins). 'My Place' was published in 1987 for distribution in Australia’s bicentennial year (1988) and makes a strong statement about the fact that Indigenous Australians were here for thousands of years before white settlement (there isn't space to unpack this). It is a very clever book that takes one suburban block (and the surrounding area) and tells the story of this place in reverse chronological sequence, decade by decade, from 1988 back to 1788 when the first British Fleet landed at Botany Bay. The overall meaning of the book is shaped by multiple narrative recounts of the families who have lived in this spot, 'my Place' and the changing nature of the physical landscape and built environment. Our excursion as a family around the streets of Tempe and St Peters in Sydney enriched my appreciation of the book and my grandchildren's sense of the place. As well, it gave my grandchildren a great introduction to Australia's history since white settlement in 1788 and it deepened our understanding of the book. The book has been used as the basis of a television series which screened recently in Australia (here). There are many other wonderful books that are situated in specific places that can be explored after, before or during thew reading of a book. Here are three more. Make Way for Ducklings (1941) was written and illustrated by Robert McCloskey. It tells the story of a pair of mallard ducks that choose a small island in a pond in the Boston Public Garden to lay their eggs and raise their young. The plot traces the mother taking the ducklings for their first major outing. She leads the ducklings ashore and straight to the highway but has trouble (not surprisingly) crossing the busy road. A policeman named Michael who likes feeding peanuts to the Mallards, stops traffic for the family to cross. This wonderful book won the Caldecott Medal in 1942. If you visit the garden today you can view the pond and the island and retrace the steps of the ducklings. There is a statue in the park of the mother and her eight ducklings. 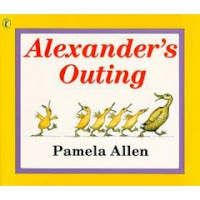 'Alexander's Outing' (1993) by Pamela Allen is a wonderful picture book (like McCloskey's) that is set in the centre of a busy city. This time it is Sydney and the beautiful Hyde Park (particularly the Archibald Fountain). Alexander is a duck who lives with his mother and four brothers and sisters in Sydney's Royal Botanic Gardens. Alexander's mother becomes bored and decides to take the family for a walk. Alexander is separated from the family and falls down a deep dark hole. How do you get a duck out of a small hole in the ground? Hint - think about water and ducks! 'Playing Beatie Bow' (1980) by Ruth Park is a novel for 10-14 year olds that once again is set in a precise location that can be explored. This is one of the books that I featured in a post on historical fiction last year (here). When Abigail Kirk joins in a traditional chanting game of 'Beatie Bow' in modern day Sydney she sees a mysterious urchin girl in the background and follows her. Unwittingly she stumbles into the past as she follows her up stairs and down alleys in the Rocks area of Sydney. She encounters a strange and different Sydney and finds herself walking the streets of the colony of New South Wales in 1873. Abigail is taken in by the Bow Family who believes that she is a mysterious 'Stranger' who is said in tradition to arrive to save 'The Gift' for future generations of Bows. Abigail remains in this past world to fill her role and in the process falls in love for the first time. The Rocks is a wonderful area of Sydney right on the harbour where white settlers made their homes in the early days of the colony. The period in which the book is set (1870s) can still be easily imagined as you walk streets that have changed little in the last 150 years. I wrote a post about Kenneth Grahame's classic book the 'Wind in the Willows' to mark the centenary of its publication. This wonderful book is read less by children today but deserves our attention. This is rich narrative, with wonderful characters and word choice and sentence structure that is as close to perfect as you can get. But there is more. Here is language that is symphonic, with the rhythms of each sentence and the choice and ordering of words matching exquisitely the settings, situations and atmosphere that Grahame has created. Or perhaps it’s the other way round. You can also view the wonderful DVD version (HERE), you can see the story in the form of a play in a setting that evokes much of the wistful summer charm of Grahame's book. While the Cornish village of Lerryn lays claim to being the setting for 'Wind in the Willows' it might just as well have been any one of a number of other small villages or stretches of lazy English rivers like the Thames where Grahame eventually retired after leaving banking, spending his life "messing around in boats" just like Ratty. There are lazy rivers all over the world that resonate and help to evoke the rich experiences that Grahame writes about. In fact, a stroll along many of the creeks that I frequented as a child in Australia with their native She Oaks (a species of Australian Casuarina tree), low flying kingfishers, slow moving water and glimpses of water rats and low flying dragon flies, evokes the same emotions (for me) as Grahame's novel. 'Looking for Crabs' (1993) by Bruce Whatley could be set on just about any Australian beach and probably plenty of white sand beaches around the world. 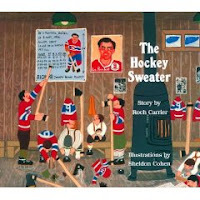 It is a simple picture book about a family outing and as always the children begin to look for things. But where are the crabs? This amusing story transports you straight to the beach. Reading it after or before a beach outing will enrich the experience and the reading of the book. 'Hairy Maclary From Donaldsons Dairy' by Lynley Dodd - find out what a 'Dairy' really is in New Zealand as this little dog and his friends have lots of adventures. 'The Lighthouse Keeper's Lunch' by Ronda & David Armitage - what would life be like living in a Lighthouse on any coastal outcrop (watch out for pesky seagulls!). I wrote a post last year title 'Making History Come Alive With Literature' (here). I talked about this in detail then, but briefly, my point was that our appreciation and knowledge of history can be enriched by good literature. In keeping with this post, it works in reverse as well. Visiting a place rich in history can enrich your experience of literature. For example, while visiting Fremantle in Western Australian in September last year I visited, the Western Maritime Museum, specifically, the historic shipwrecks gallery. A central part of this museum is part of the wreck of the Batavia that floundered on uncharted rocks of the Western Australian coast on 4th June 1629. The circumstances surrounding the Batavia and the fate of its crew and passengers have made it the most famous of the early ships to flounder upon Australia’s at times treacherous coast. This is a true story of death, murder, treachery and survival. In the museum gift shop I discovered Gary Crew’s adolescent novel ‘Strange Objects’ (1990). Crew's story takes part of the tragedy of the Batavia and tells a story that illuminates this historic event while telling a powerful human story. Visiting the museum, viewing the wreck of the Batavia, travelling along the coats of Western Australia and reading Crew's story all enriched one another. History and place also enriched the literary experience and the reading of the book increasing my appreciation of the historical events. 'My Hiroshima' by Junko Morimoto - a picture book that offers a real life account of the day the atomic bomb was dropped on Hiroshima through the eyes of a child who stayed home that day sick rather than going to school. 'The Machine Gunners' by Robert Westall - live through the Blitz bombings in World War II Britain as a group of young boys collect the ultimate war souvenirs as they drop around them. 'Slave Girl: The Diary of Clotee, Virginia, USA 1859' by Patricia McKissack - learn about a 12 year old slave girl living just before the American Civil war who longs for freedom. 'The Thieves of Ostia' by Caroline Lawrence - I visited the ruins of Ostia about 10 years ago (it's incredible!) and wish that I'd read this mystery about Flavia and her friends in the ancient Roman port in the 1st century AD before or just after the trip. The above are just examples of the many wonderful ways that linking books with places, experiences or specific time periods can enrich literature, language and learning. I would love to hear some of your favourite examples. 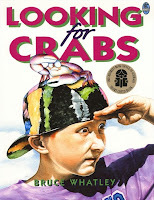 We borrowed "Looking For Crabs" specifically to take on holidays and also Alison Lester's "Magic Beach" a few months ago. (Think I blogged about it too...) Going to the beach made the books come alive for the kids, and reading the books meant the kids got so much more out of the beach! A lovely cycle. 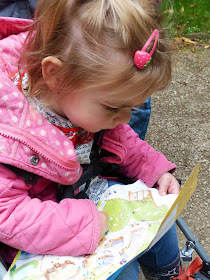 I was like a big kid at Beatrix Potter's house too when we visited (many years ago) with our children. I was just as bad at James Barrie's early home in Scotland (Forfar). Looking For Crabs is a favourite here too. We can often be heard saying, "There are no crabs at our beach...", after we have been looking for a while. Thanks for the other great ideas. Thanks Jo. It's amazing how the language of books can become part of your life. I've written about this before in one of my books ('Other Worlds: The endless possibilities of literature'). Nice to hear from you. I may blog on it some day. We often quote from 'Counting on Frank' too. where people share their favorite quotes from kid's books.